Hunting in Colorado often feels boundless, with public lands that include 23 million acres of pristine pines, plentiful pocket meadows and pure-water ponds, so it’s no wonder Colorado hosts the world’s largest elk herd and the best chance at hunting, or simply viewing, these majestic animals in motion. Species: Mule deer in the mountains, whitetail on the plains or the legendary elk of the Rockies — these are only some of many species that call Colorado home. Method of Take: Go primitive with a longbow, stay modern with a centerfire rifle or split the difference with muzzle-loading. Colorado is accommodating to most types and styles of take as long as you have that handy hunter education card (from Colorado or your home state). Season: It’s hard to resist hunting among golden aspen leaves in early season bow-and-muzzle-loading seasons, but cool weather and snow often help in a successful hunt. Big-game seasons run from August through January. Scout It Out: Make a pre-season basecamp in one of Colorado’s welcoming small towns and bring friends or family along. Staying stealthy any time of year can reveal the secret side of wilderness, which loud or talking hikers rarely encounter. Fish Side Dish: Big-game habitat almost always overlaps with small-game and fish habitat. Bring along that shotgun or fishing rod and experience the richness of Colorado’s varied terrain. Love at First Site: Adherence to Colorado’s hunting and fishing guidelines are extremely important to the overall health of the wilderness. The first responsibility on any trip is to visit wildlife.state.co.us or pick up a printed manual to stay up to date on changes in the law. Learn: Colorado Parks and Wildlife offers Elk Hunting University, instructional videos and a whole lot more to get you ready for the hunt. And find information on outdoor survival, a guide to Colorado’s game management units, scouting tips and numbers to call when you have questions. Plan: Apply by mail or online for limited-draw licenses, always due on the first Tuesday in April. For more information on dates and fees, visit Colorado Parks & Wildlife. 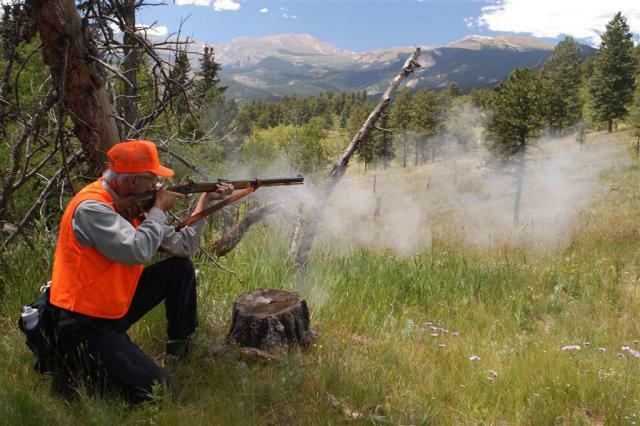 Find a directory of Colorado hunting outfitters, who can lead you on guided or semi-guided hunts, as well as Colorado Parks and Wildlife field offices.